Cooking fried rice is easy, tasty and with a wide margin of error. You may wonder why I write such a simple recipe in great detail in this post. Most Asian restaurants prepare fried rice with high power stove that generates intense heat, which is essential to produce excellent fried rice. However, most people do not have the luxury to have it in your comfy home. 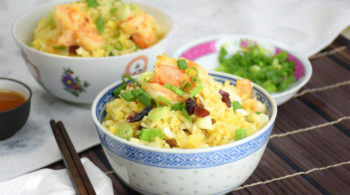 The first part is the video of how to cook the Chinese style fried rice, and the complete recipe. The second is a collection of ten time-tested fried rice techniques that will transform you into an expert. These tips will elevate the humble fried rice to the next level, and turn it into a culinary wonder. One thing common to all types of fried rice is that there are a set of universal techniques for any fried rice. 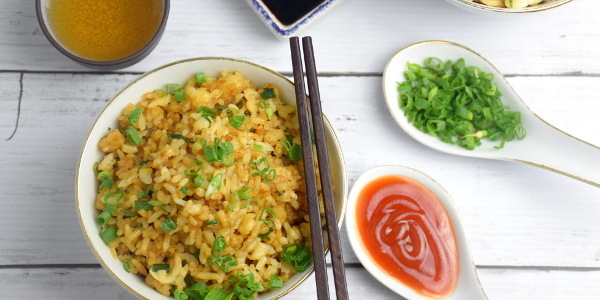 The must-have distinct and well-separated grains should be sticky enough to easily pick up with chopsticks or a spoon, the exterior of the grains should be slightly brown and the interior remains soft, and the rice should be slightly chewy to bite. 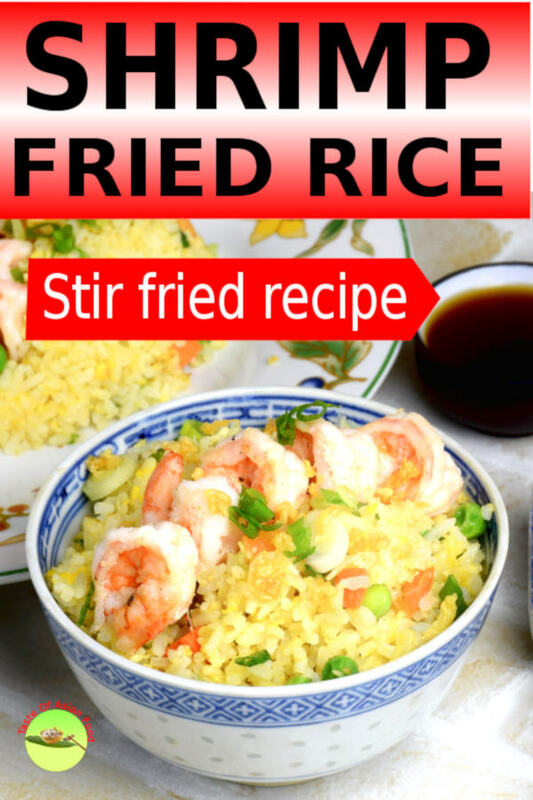 Before we look closer at these technical aspects, let’s find out which are the various popular types of fried rice and the differences among them. The best type of rice for frying should be less starchy, fragrant, and have a chewy texture. 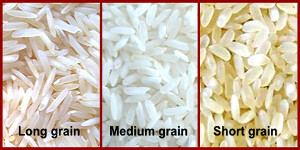 Medium grain rice boasts a great balance of chewiness and ability to maintain the shape of individual grains after frying. 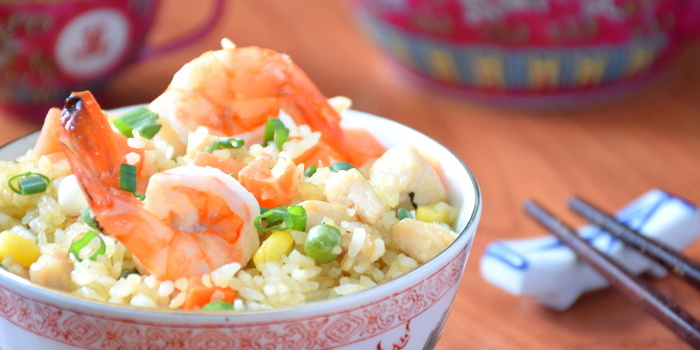 Thai fragrant Jasmine rice has a perfect balance of stickiness and not easily getting mushy. Both have a superior texture and are best for fried rice. On the other hand, short grain sushi rice is stickier and starchier. It is easily clumped together during frying. Unless you are preparing Japanese fried rice, this is not an option to look for. Longer grain rice such as Basmati rice lacks the plumpness of medium grain rice, which results in fried rice that is dry and hard. Tips: Medium grain rice is the choice for fried rice. Have you ever wondered what the purpose is of rinsing the rice before cooking? Rinsing the rice serves two purposes. Most of the rice in Asia (where I live) is not very clean. The rice should be rinsed to remove any husk, sand, and impurities. Rinsing will remove the excess starch, the culprit that causes rice grains to clump together while stir-frying. 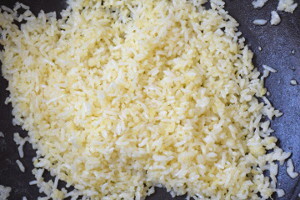 Therefore, rinsing is far more important for frying rice than boiling plain rice or preparing sashimi and risotto that the stickiness of rice is relevant. 1. Fill a container with clean water. Put the uncooked, dry rice grains in it and stir it with your hand a few times. 2. Remove the starchy water and replace it with fresh water. Repeat four to five times until the water runs clear and no longer starchy. Note that you do not need to do this if you want to cook plain or biryani rice. You can rinse them once or twice if they are not clean. At the other extreme, you do not rinse Arborio rice to make risotto because you want to preserve as much starch as possible. 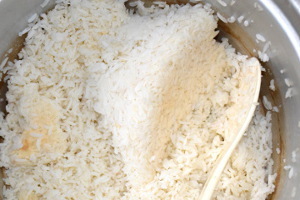 Fluff the rice as soon as it is cooked, as it tends to harden and solidify into a block when it cools down. When you want to fry the rice, check whether the rice grains clump together. If this happens, break up the lumps with your hands. It ‘s hard to break up the rice during stir-frying. 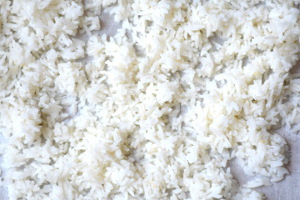 The rice should separate into individual grains without breaking or getting crushed. The surface of the rice grain should be slightly browned, which creates the signature aroma. You can’t brown the surface if the grains are clumped together, and the aroma (or wok-hei as the Chinese described it) will never be created. Fluffy rice is not only good for fried rice. It is also important to serve with plain steamed rice. Make a habit of fluffing the rice immediately after cooking it. A plate of perfect fried rice should have a slightly brown surface and a soft and chewy center. The surface of the rice grains should be dry enough to get the good browning effect while frying. The surface moisture of the wet rice can rapidly reduce the temperature, causing the rice to stick together and does not brown efficiently. Cook the rice with slightly less water than normal. 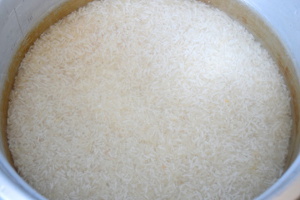 The rice has lower water content and can be fried immediately after cooking without facing the problem of stickiness. However, the rice tends to become too hard and not chewy. 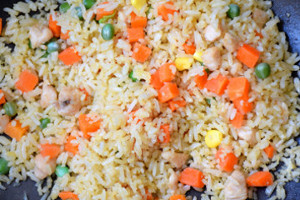 Fried rice cooked with the normal amount of water is not suitable as it will clump together easily. There are a few ways to keep the surface of the rice dry and achieve a good browning effect. Use overnight rice. Traditional Chinese chefs prefer to use overnight rice to prepare fried rice. However, the grains tend to clump together even it is fluffed. Also, it tends to lose moisture on the surface as well as in the centers of the grains. As a result, it tends to be harder and less chewy. Use fanned fresh rice. Fluff and spread the rice thinly on a tray. Blow it under a fan until the rice is dry enough for the grains not to clump together. Make sure the rice is not too dry and doesn't turn hard. Otherwise, the fried rice will be just as hard as the day old rice that has been unattended. This method gives better control over the moisture content than the overnight rice left in the fridge, and it is easier to dry only the surface and keep the centers of the rice grains moist. The rice is also fresh, not stale like the overnight rice. Generally, fried rice should be seasoned with a small amount of soy sauce, salt, oyster sauce or fish sauce. The flavor of the rice should be highlighted, not the seasonings. While it is generally recommended that fried rice doesn’t need a ton of sauce, Indonesian nasi goreng contain a large amount of chili paste and sweet soy sauce. The following list shows what seasonings are used normally, but there are still plenty of variations in different regions of the world. 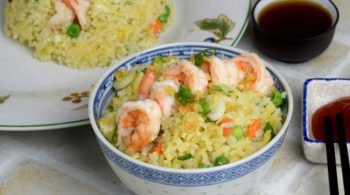 Chinese fried rice- light soy sauce and dark soy sauce are used. Some chefs prefer just a pinch of salt to keep the bright color of the rice. 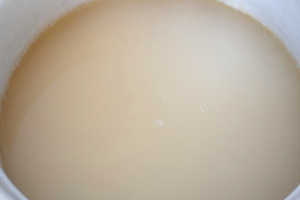 If you use too much of soy sauce or oyster sauce, the color of the rice will become dark and not aesthetically appealing. Chinese-American fried rice- tomato ketchup and Worcestershire sauce are used to render a whole new flavor. Thai fried rice- uses fish sauce, soy sauce, and sugar. Japanese fried rice- Mirin (sweet Japanese cooking wine), Japanese soy sauce. Despite the different seasonings, the key to making the fried rice smell aromatic is keeping the rice dry during stir-frying. Therefore adding the sauce little by little to keep the rice dry is the best practice. Premium light soy sauce with a pinch of salt is all you need to season Cantonese-style fried rice. 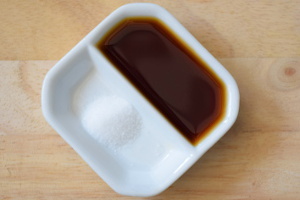 Other common seasonings are fish sauce, sesame oil, dark soy sauce, white pepper and oyster sauce. Eggs are the essential ingredients for fried rice. The simplest egg fried rice (鸡蛋炒饭) only required egg and light soy sauce, which is still a delectable meal by itself. This is analogous to a masterfully prepare plain agleo e oleo spaghetti with only olive oil and garlic. Its success depends on the cook’s skill, nothing less, as there are no other ingredients to enhance the flavor. Just fry an egg (normally an easy-over egg) and put it on top of a plate of fried rice. This is how Indonesian nasi goreng is usually presented. Since Indonesian fried rice contains plenty of chilies, it does not matter that the eggs are not mixed into the rice. Coat the rice with eggs. 1. Fry the rice in the wok until the grains are slightly brown and smell fragrant. 3. Once the eggs are totally dry, add the soy sauce, seasonings, and other ingredients. 4. Stir fry on intense heat for a minute to create wok-hei. This method enhances the flavor of all rice grains with eggs, much like fish fillet is covered in batter. It is a little more technical, but worth the time to perfect the technique. Cook an omelet. Push the rice to the side of the wok. 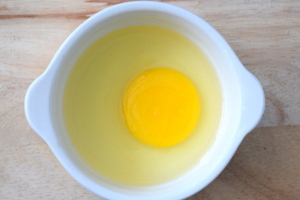 Pour some oil into the bottom and add a whisked egg to make an omelet. Use wok spatula to break up the omelet into small pieces and mix with the rice. This is a common way to add an egg in most of the fried rice recipes. Wok is the best cooking utensil for cooking fry rice. Wok has different zones of heat that make controlling of temperature an easy task. Its spherical shape makes tossing and flipping a snap, with little chance of food pieces falling out as they would from a flat pan. 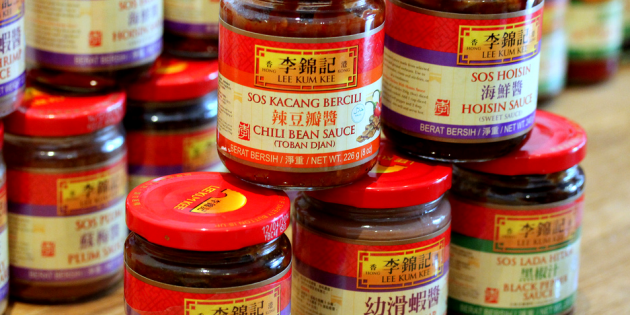 It sits perfectly on the wok burners that can generate intense heat and plenty of wok hei. 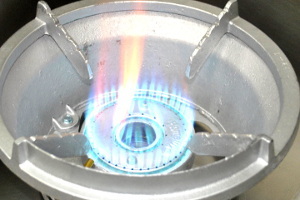 However, the wok is not designed to be used on Western-style burners. Stove tops with induction or a heating coil cannot generate as much heat as a wok burner. These are the limitations most home cooks are facing when trying to replicate the restaurant standard fried rice. There is a workaround, albeit it’s not perfect. Below is my tested method. 1. Use a flat-bottomed wok or pan so that you can place it on a flat stove top. 2. Add some oil to the pan and wait until it is piping hot before adding the rice so that the exterior has a chance to brown. 3. Use a larger pan than what you think is enough. This will help prevent food from falling out during stir-frying. 5. Keep tossing and stirring to prevent the rice from sticking to the pan. 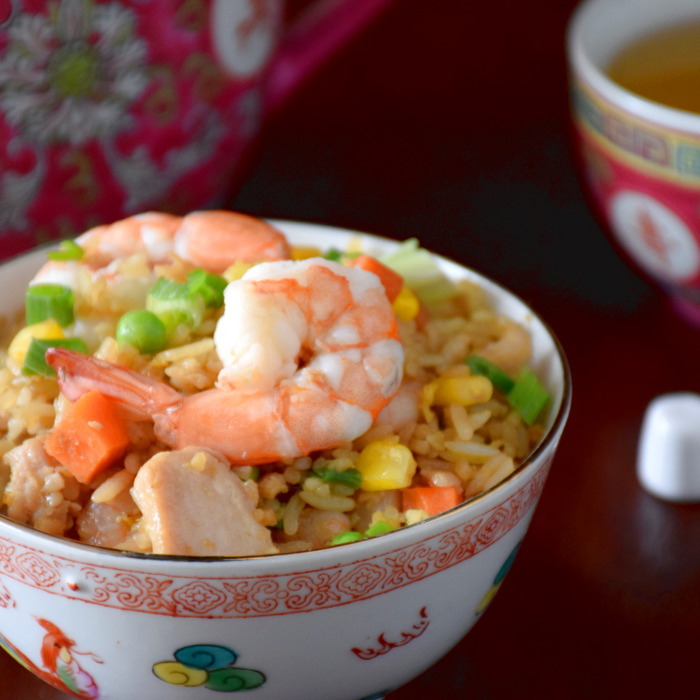 Fried rice is a perfect dish for using up various leftovers. You can make chicken fried rice of shrimp fried rice out of your leftovers, but the following guideline applies to all types of fried rice. 1. Cut the ingredients into small pieces. All the vegetables, meat and seafood should be in small pieces so that they can be cooked quickly. 3. The egg is the best ingredient for fried rice. It enhances the flavor of all types of fried rice. 4. Use aromatics. Saute the aromatics (garlic, onions, spring onion) with oil. The aromatic oil enhances the flavor of the rice, just like infusing garlic flavor to the oil for a plate of aglio e oleo pasta. 5. Use less liquid. Use a small amount of liquid (soy sauce, fish sauce etc). Adding water is a definite ‘no’. 6. Meat and seafood. Chicken, pork, and beef should be sliced thinly. Prawns and crab meat are good alternatives. Fish meat is not suitable as it will fall apart while stir frying. 7. Vegetables. It depends on the recipes. Chinese fried rice includes chopped spring onions sprinkled on top, whilst Thai fried rice may prefer basil. A mix of frozen green peas, corn, and diced carrots is a convenient combination to add shapes and colors. 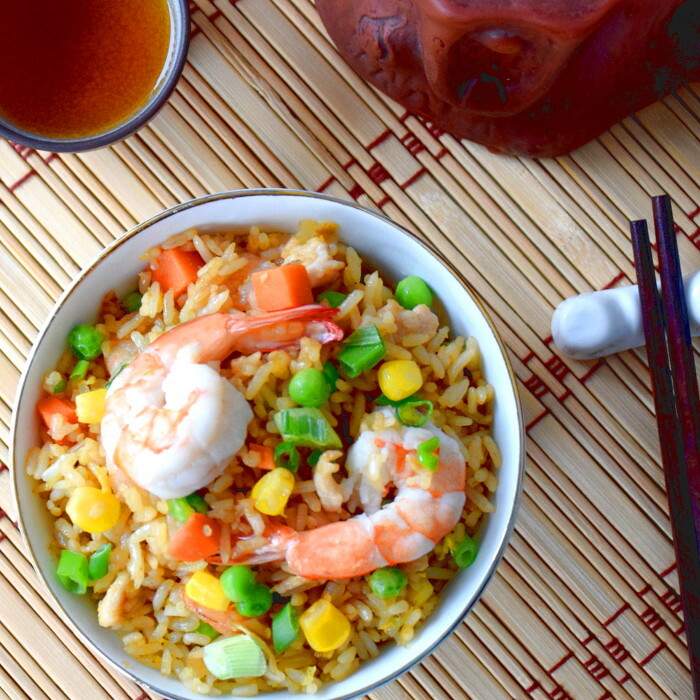 The choice of oil for fried rice plays an important part to create the authentic Asian flavor. 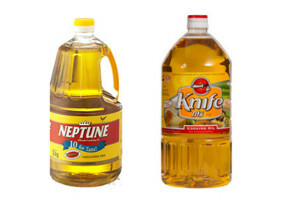 Oils suitable for stir-frying are peanut oil, vegetable oil, and palm oil. They have a high smoking point which is suitable for stir-frying and a neutral taste that will not affect the flavor of the fried rice. Olive oil and butter are not suitable for cooking oriental fried rice. They do not have a neutral flavor and the smoking point is relatively low. There are many ways to fry rice. The proponent of each method vouches that they have the best method. The reality is that there is no ‘best’ method, as it’s all a matter of personal preference. However, producing wok-hei is so tricky that it is often used as a measure of the credibility of a Chinese chef. When cooked correctly, the “essence” of the food comes from the flavor. The dish is said to “have wok hei 有镬气 “. To impart wok-hei, the food must be cooked in a wok over intense heat while being stirred and tossed quickly. In short, stir-fry the rice on high heat whenever possible. This is the simple fried rice recipe of restarant quality that you make it at home. Heat up the vegetable oil in a wok or large saucepan. Saute the minced garlic until aromatic. 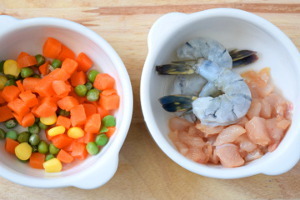 Add the shrimps, follow by the chicken meat and stir-fry until they are cooked. Remove the shrimps and meat. Leave the remaining oil in the wok. Add the cooked rice and stir-fry over low heat until the rice turns aromatic, spluttered and sizzled. Beat an egg. Pour the egg over the rice. Coat the rice grains with the egg. Continue stir fry until the egg is cooked and no longer sticky. Return the shrimps and chicken to the wok. Stir-fry for a minute. Add the beans and the light soy sauce. Stir-fry over high heat until the rice becomes dry again. Sprinkle the chopped scallion on it and serve. 20 replies to "How to cook the best restaurant style fried rice"
Thanks very much for this. I am newly employed in a chinese restaurant and really need help and more techniques to prepare the best chinese meals. You are welcome. Enjoy your fried rice. Thanks KP for sharing these much details. I am now more prepared to attempt fried rice again. Thank you for trying the recipe, and glad that you like the fried rice. Thank you for trying out the fried rice recipe, and glad to know that you like it. The best way is to cook each of them one after another. The reason is that the heat of the stove is not high enough to prepare 6 portions at once. The fried rice will become lack of wok aroma. A ‘cheat’ method used by some Chinese restaurant: The cook the fried rice in bulk (e.g. 6 portions in one wok as your case) until it is 90% done. Then they remove the rice from the wok. Set aside. When customer order, they measure one portion and put back to the wok and stir-fry over high heat for a short while, usually less than 30 seconds. Once he/she smell the aroma from the wok, remove and dish up. Hi there! The recipe looks awesome and is something that I will want to try. However, I would like to ask, when will you turn up the heat during the process? Is it after the eggs have been cooked with the rice? Thank you! Hope this clears your confusion about this restaurant style fried rice recipe. I use the same method to cook Yang Chow fried rice. You can take a look at this recipe. KP, I am on the Keto diet. We use cauliflower rice instead of real rice due to the high carb count in rice. Could you help me perfect the fried cauliflower rice? We chop up cauliflower small. Should we cook it somehow first before stir frying like you do the rice? Please help! We love fried rice but can’t have all those carbs! Chop the cauliflower to about the size of fried rice, then stir fry with a bit of oil. Continue with the similar step as mentioned in the recipe. I do not think you need to cook it first if it is small, as stir fry should be able to cook through the cauliflower rice. You then coat the cauliflower rice with the egg and proceed as usual.